The DSC-R418 is a linear PIN + trans-impedance amplifier with user-adjustable gain and is primarily designed for 25 to 28 Gbaud / 50 to 56 Gbps 4 level Pulse Amplitude Modulation (PAM-4) and 25 to 28 Gbps NRZ-ASK (PAM-2) modulation formats in 1310 nm and 1550 nm single-mode systems. It is available in Discovery's self-contained Lab Buddy instrument. 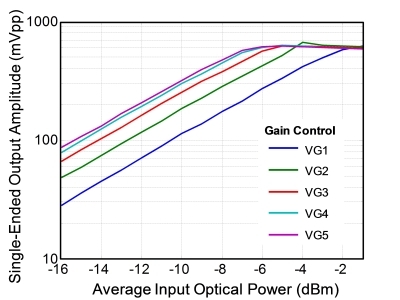 The DSC-R418 has a differential conversion gain of up to 3000 V/W, offers linear response to > -6 dBm optical input, -3 dBm of optical overload, and a maximum differential peak-to-peak output of > 1 V.
Fig. 1: DSC-R418 Lab Buddy instrument. Fig 2: Linearity plot of DSC-R418.